This card features more of the background paper that I stamped with the Avant-Garden stamp set (FREE during Sale-A-Bration with a purchase of $90). Click here to learn more about Sale-A-Bration and making the most of the amazing free products on offer - it starts today and ends on 31st March. Sweet Sugarplum and Beautiful You go so well together! The paper I used for the dress and hat is the patterned side of Envelope paper from the 2016-2018 In-Colour pack. 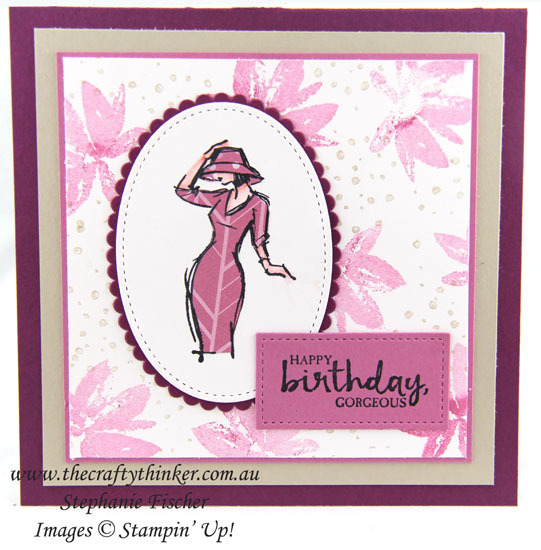 The sentiment is stamped in Basic Black onto Sweet Sugarplum card and cut out with a square Stitched Shapes Framelit - altered to create an oblong.